Conducted annually by the Virginia Insitute of Marine Science and the Maryland Department of Natural Resources since 1990, the winter dredge survey is the primary assessment of Chesapeake Bay’s blue crab population. Survey scientists employ crab dredges to sample blue crabs at 1,500 sites throughout the Bay from December through March. By sampling during winter when blue crabs are buried in the mud and stationary, the scientists can estimate, with good precision, the number of crabs present. 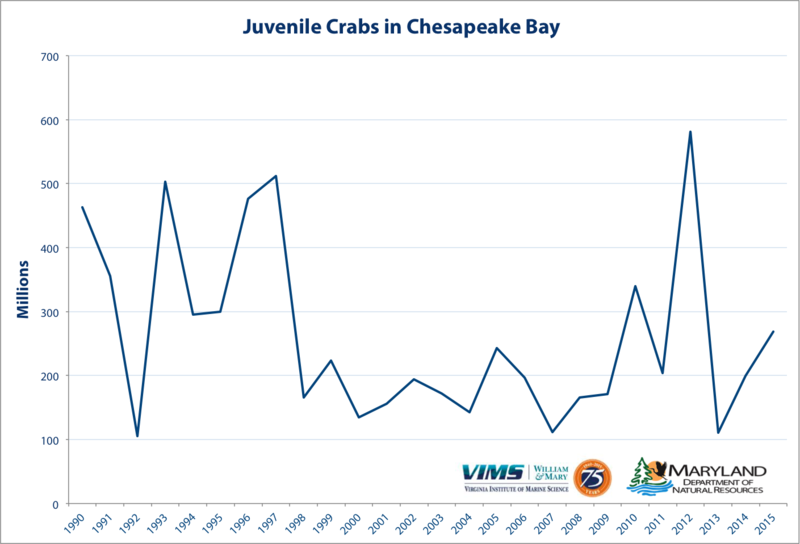 While juvenile and spawning age female crab numbers increased a bit and last year’s harvest remained at a safe level (under the target fishing removal rate) for the seventh consecutive year, the total abundance of crabs was only the 11th highest in the past 25 years. The long, abnormally cold winter appears to have resulted in one of the worst overwinter mortality events since the start of the winter dredge survey, causing the death of 29% of all adult crabs in Maryland. The winter mortality rate was well above the average. Despite that severe setback, the crab stock improved. 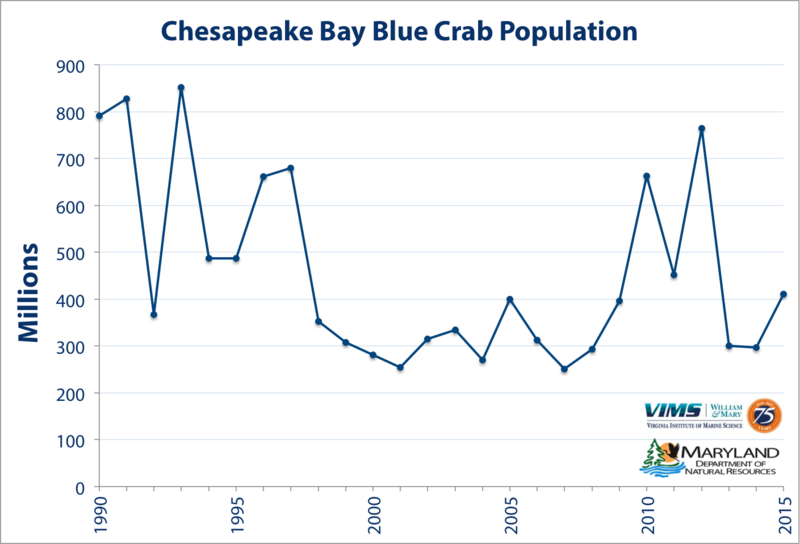 A bay-wide 10% crab harvest reduction enacted last year by VMRC, Maryland, and the Potomac River Fisheries Commission to combat low overall crab abundance and to boost a dangerously depleted female spawning stock apparently was effective and just in time. This year’s overall bay-wide crab abundance increased from 297 million crabs to 411 million crabs, a 38% increase. Juvenile crabs jumped from 199 million to 269 million, a 35% increase, and now comprise the bulk of the crab stock. 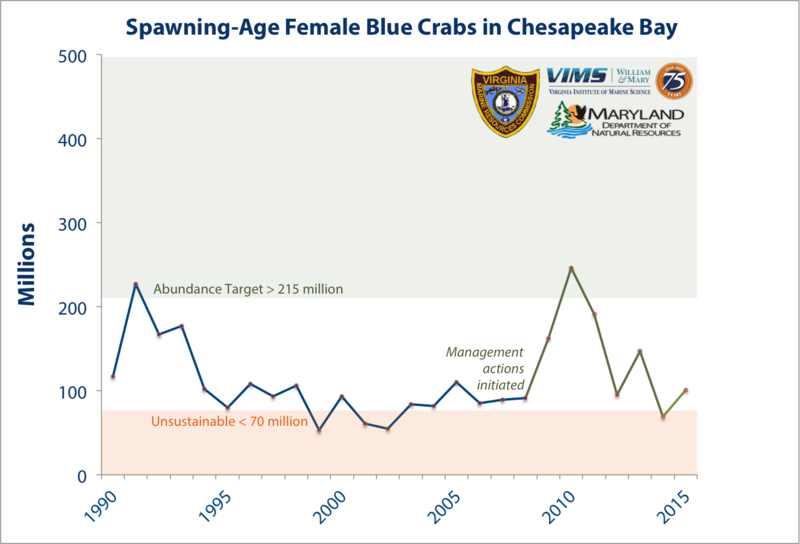 Spawning-age female crab levels emerged from depleted status, increasing from 69 million to 101 million, a 46% increase, but remained well below the healthy-stock target of 215 million. Spawning-age females are the cornerstone of stock rebuilding. Spawning-age males increased from last year but their abundance of nearly 44 million remains the third lowest in the past 25 years. 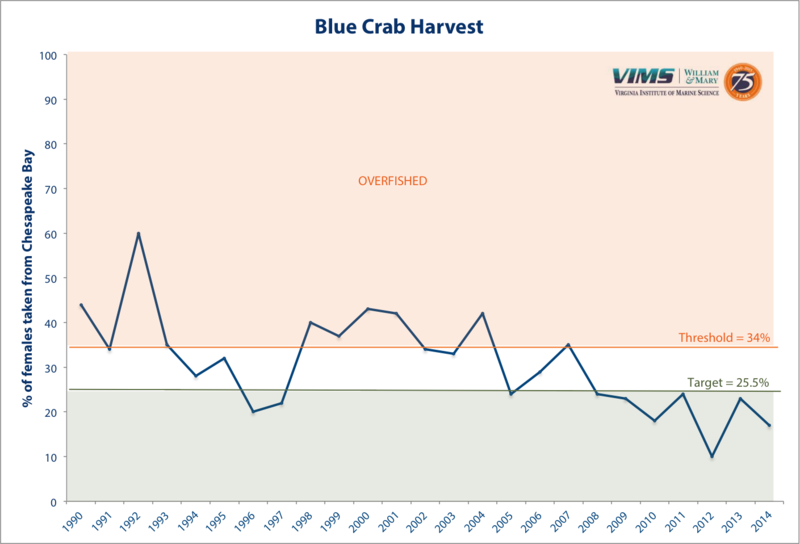 Although the overall number of crabs in the bay improved, the stock remains just above pre-2008 levels, when a coordinated bay-wide stock rebuilding program kicked off. “The increase in blue crab numbers is a positive sign toward the commitment of the 2014 Chesapeake Bay Watershed Agreement to rebuild long term sustainability of blue crab populations,” says Peyton Robertson, chair of the Chesapeake Bay Program's Sustainable Fisheries Goal Implementation Team. Commercial crabbers can expect to see more crabs in their crab pots this year than last year and to more often catch their daily bushel limits, but this year’s abundance levels would seem to preclude the possibility of reopening the winter crab dredge fishery, which has been closed annually since 2008. Crab spawning naturally fluctuates and can be affected by wind, tide, weather, and increased predation on crabs by other species. During the past two years, unexpected predation events and abnormally harsh winters have negatively impacted the crab stock and have highlighted the need for fishery managers to enhance resilience of the stock through adaptive management to compensate for unusual or extreme environmental stresses. The Chesapeake Bay Stock Assessment Committee is reviewing the new survey results and will release their full analysis of the results in the 2015 Blue Crab Advisory Report this summer. The advisory report is used by managers as they review and update fishery regulations. “The survey results show an increase in overall blue crab abundance but female abundance is still below the 215 million target. This suggests maintaining a precautionary approach to managing the population” says Joe Grist, Chair of the Chesapeake Bay Stock Assessment Committee. VMRC will begin discussions with its crab management advisory committee today, April 27, and the Commission’s board will be briefed on the survey results tomorrow.